ਵੇਖੋ ਭਾਰਤ ਦੇ ਸਭ ਤੋਂ ਪੁਰਾਣੇ ਅੰਗਰੇਜੀ ਅਖਬਾਰ ਨੇ ਕਰਤਾਰਪੁਰ ਲਾਂਘਾ ਅੰਦੋਲਨ ਬਾਰੇ ਕੀ ਕਿਹਾ? AMRITSAR: An appeal by the SGPC to Union home minister Rajnath Singh for taking up the issue of construction of a corridor between Dera Baba Nanak in Gurdaspur district and Kartarpur Sahib in Narowal district of Pakistan with the government there has given hope to those pursuing the matter for the last nearly three decades. Encouraged by the SGPC’s initiative, activists of Sangat Langah Kartarpur (SLK), an NGO spearheading the movement for the construction of the corridor, and residents of various villages around Dera Baba Nanak gathered close to the international border on Thursday. They offered prayers while looking towards Gurdwara Kartarpur Sahib, which on Thursday had a clear view under the bright sun, some 4km away from international border across the Ravi in Pakistan. “At least, the SGPC has conveyed to Rajnath about the significance of the corridor for the Sikhs,” SLK president B S Goraya said. He said SLK activists and residents of Dera Baba Nanak and nearby places had gathered close to the international border to offer prayers for the construction of the corridor. “This is how we can peacefully raise our voice,” he said. On March 13, SGPC president Gobind Singh Longowal had asked the Union home minister for the construction of a corridor ahead of the 550th birth anniversary of Guru Nanak Dev. After completing four journeys, Guru Nanak had reached Kartarpur Sahib in 1522 and lived a simple life working in the fields for nearly 17 years before leaving for heavenly abode in 1539. Goraya stated that in 1999 the then Pakistan President, Pervez Musharaff, had offered to construct the corridor but no formal proposal was sent to the Indian government. Former President Pranab Mukherjee in his capacity as the external affairs minister had visited Dera Baba Nanak in 2008 to assess the feasibility of the corridor for the convenience of pilgrims. Gurnam Singh, a local resident, said that presently, the Sikhs who were not able to travel to Pakistan for paying obeisance at Gurdwara Kartarpur Sahib, reach Dera Baba Nanak and offer prayers while looking towards the shrine with folded hands from the international border. “A corridor will fulfil the religious wishes of lakhs of Sikhs,” he said. In 2010, the Punjab assembly passed a resolution, asking the Union government to take necessary measures for the construction of the corridor. 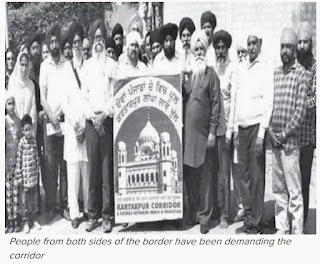 Puran Singh, a resident of Batala who was on pilgrimage to Gurdwara Kartarpur Sahib in recent past, said that Sikhs in Pakistan were also keen to have the corridor so they could simply walk to Gurdwara Kartarpur Sahib, pay obeisance at the Golden Temple and return the same day. 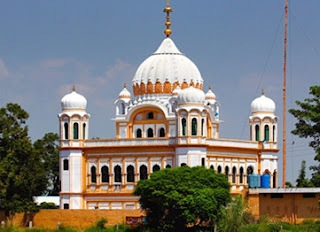 AMRITSAR: Sangat Langah Kartarpur, an NGO, has expressed fears that the heritage building of Gurdwara Sri Darbar Sahib at Dera Baba Nanak in Gurdaspur district could be demolished. The NGO said this following the handing over of karsewa (volunteer work) to a religious outfit. Shiromani Gurdwara Parbandhak Committee (SGPC) has, however, denied the reports. For 18 years now, the NGO has been leading a movement for the construction of a corridor between Dera Baba Nanak and Gurdwara Kartarpur Sahib in Narowal district of Pakistan, which is about 4km from the international border. He said that the building of gurdwara was built in 1744 and later Maharaja Ranjit Singh offered a copper-gilded palanquin to the worship place. Goraya said that he was told that there was need of construction of a new gurdwara building as water seepage at various places in the heritage building had damaged the structure. When contacted, SGPC chief secretary Roop Singh said, “For now there are no plans to construct new Gurdwara building and whenever SGPC deems it fit to erect new building it would be done with full planning.” He, however, added that an SGPC team had visited the gurdwara for clicking photographs which were required for printing in the calendar.